A spectacle from France's Ilotopie, performed on Lake Michigan—think of it as Cirque du Soleil Goes to Sea. Fri-Sat 8/21-8/22, 9:15 PM Sat-Sun 8/22-8/23, 9:15 PM, eastern edge of Navy Pier, 800 E. Grand, 312-595-5600, chicagoshakes.com. $15 "priority bleacher seats" have sold out, but free seating and standing room are available on a first-come, first-served basis. Think of it as Cirque du Soleil Goes to Sea. Or Venetian Night Meets Salvador Dali. Or just plain Very Similar to Certain Cool Things Redmoon Theater's Done From Time to Time. 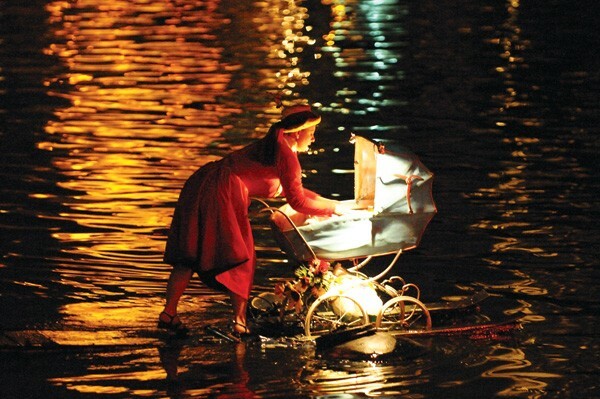 Like, for instance, Redmoon's 2004 performance in Ping Tom Memorial Park, with its river-borne lantern procession, this spectacle—to be staged on Lake Michigan by France's Ilotopie—combines fire, water, strange conveyances, and eccentric characters. But judging by the images in a highlights video, the mix is notched up considerably in Water Fools. Where the dominant mood of the Redmoon piece was quiet and dreamy, the feel here is dreamy with how'd-they-do-that tech effects and loads of explosions. A woman in a red ball gown skims along on what appears to be an enormous gerbil wheel. Someone in a nightshirt rows a bed. A car and trailer ride the surface of the water. A clown bikes it. And seemingly everywhere, fireworks shower the night with sparks.